This Bradshaw rock painting from Australia shows tasseled costumed figures in various poses or actions. This list presents a small selection of the work of artists who lived during the time that writing hadn't as yet been invented and popularized in human societies. 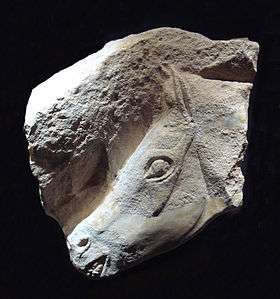 This page contains, by sheer volume of the artwork discovered, a very incomplete list of the paintings, drawings, sculptures, engravings, and other works by the artists who created what we now call prehistoric art. For fuller lists see Art of the Upper Paleolithic, Art of the Middle Paleolithic, and Category:Prehistoric art and its many sub-categories. Adam of Govrlevo, or "Adam of Macedonia". 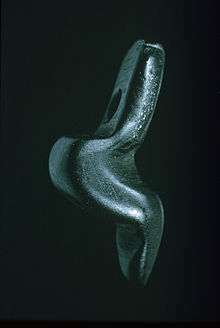 At more than 7,000 years old, the sculpture is the oldest artifact found in the Republic of Macedonia. The artist depicts a sitting male body, and shows details of his spine, ribs, navel, and phallus. The piece is now exhibited in the Skopje City Museum. Bird stones. People have found thousands of these portable bird-shaped stone sculptures created by generations of North American sculptors. Montastruc decorated stone. The artist has scratched or engraved a human figure - which appears to be female - as he or she decorated a fragment of a piece of limestone used as a lamp. From Courbet Cave, France, it now resides in the British Museum. The Shigir Idol, a 11,000 years old wooden sculpture, resides in the Historic Exhibition Museum in Yekaterinburg, Russia. The Alunda moose is an Neolithic artistic stone axe c.2000 B.C. that was found in Uppland, Sweden. It is displayed in the Swedish History Museum. Altamira cave (Spain) - in 1879 the first prehistoric paintings and drawings were discovered in this cave, which soon became famous for their depth of color and depictions of animals, hands, and abstract shapes. Bhimbetka rock shelters (India) - the shelters, decorated with art from 30,000 years ago, contain the oldest evidence of artists exhibiting their work on the Indian sub-continent. Bradshaw rock paintings (Australia) - Aboriginal artists painted well over a million paintings in this site in the Kimberley, many of human figures ornamented with accessories such as bags, tassels and headdresses. These artworks are well over 20,000 years old. Çatalhöyük (Turkey) - probably the best preserved large Neolithic site, its artwork includes murals, figurines, and depictions of animals. The Seated Woman of Çatalhöyük was found here. 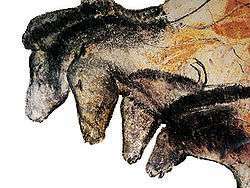 Chauvet Cave (France) - some of the earliest cave paintings known, and considered among the most important prehistoric art sites. Chufin cave (Spain) - small cave with engravings, stick figures, and artwork schematically portraying red deer, goats and cattle. Cueva de las Manos (Cave of Hands) (Argentina) - a series of caves exhibiting hundreds of outlines of human hands, hunting scenes, and animals painted 13,000 to 9,000 years ago. Côa Valley (Portugal) - artists engraved thousands of drawings of horses and other animal, human and abstract figures in open-air artwork completed 22,000 to 10,000 years ago. Cosquer Cave (France) - hand stencils from 27,000 years ago, and 19,000-year-old animal drawings that portray bison, ibex, horses, seals and what may be auks and jellyfish, showcase this gallery. El Castillo cave, one of the Monte Castillo caves (Spain) - contains decorations in red ochre paint which has been blown onto the walls in the forms of hand stencils as long as 37,000 years ago, and painted dots. One faint red dot has been dated to 40,800 years ago, making it the oldest dated cave decoration in the world. It is 5,000-10,000 years older than caves so-far found in France. Gabarnmung (Australia) - this rock-art site in the Northern Territory features the oldest artwork in Australia at over 28,000 years. 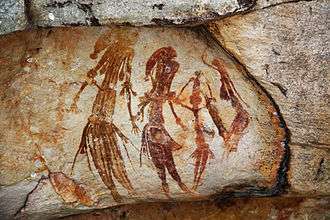 Aboriginal artists painted fish, crocodiles, people, and spiritual figures, mostly on the site's ceilings. Kapova cave in southern Ural Mountains (Russia) - presently 173 monochromatic ochre rock paintings and charcoal drawings or their traces are documented, presenting Pleistocene animals and abstract geometric motives. They are about 18,000 - 16,000 years old, from Late Solutrean to Middle Magdalenian. 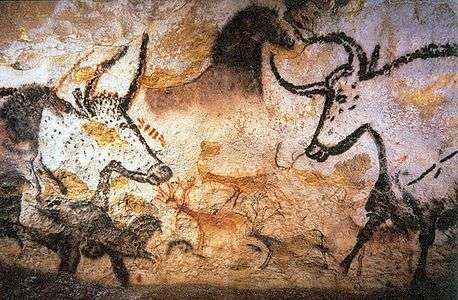 Lascaux caves (France) - contains some of the best known artworks of early painters, many of those portraying large animals. La Marche (France) - due to the style the legitimacy of the cave paintings here are in dispute. La Pasiega cave (Spain) - an art gallery created in prehistoric times, the exhibition of artwork here runs for at least 120 meters. Les Combarelles (France) - two galleries showcase more than 600 engravings. The more-than-11,000-year-old artwork portrays such subjects as reindeer drinking water from the river that flows through the cave, cave bears, cave lions, mammoths, and various symbols. Roc-aux-Sorciers (France) - a rock shelter famous for its 14,000-year-old relief wall carvings. Rock carvings at Alta (Norway) - artwork includes images of Bear worship. Rock art of Figuig (Morocco) - engravings from the Neolithic age. Saharan rock art - there are over three thousand known sites where artists carved or painted on the natural rocks of the central Sahara desert. From the Tibesti massif to the Ahaggar Mountains, the Sahara is an open-air museum containing numerous works by artists of the era. ↑ British Museum (2011). "British Museum - Horse engraving on bone". britishmuseum.org. Retrieved 14 October 2011. ↑ British Museum; Ann Sieveking (1987). A catalogue of palaeolithic art in the British Museum. Published for the Trustees of the British Museum by British Museum Publications. pp. 112–. ISBN 978-0-7141-1376-0. Retrieved 14 October 2011. ↑ Donaldson, Mike The Gwion or Bradshaw art style of Australia’s Kimberley region is undoubtedly among the earliest rock art in the country –but is it Pleistocene? (free download) L’art pléistocène en Australie (Pré-Actes) IFRAO Congress, September 2010 p. 4. ↑ "U-Series Dating of Paleolithic Art in 11 Caves in Spain" by A.W.G. Pike et al., Science, 15 June 2012: 1462. ↑ "Oldest confirmed cave art is a single red dot" by Michael Marshall, New Scientist, 23 June 2012, pp. 10-11. ↑ Clottes, Jean (2003). Chauvet Cave: The Art of Earliest Times. Paul G. Bahn (translator). University of Utah Press. ISBN 0-87480-758-1. Translation of La Grotte Chauvet, l'art des origins, Éditions du Seuil, 2001, p. 214. ↑ Amos, Jonathan (June 14, 2012). "Red dot becomes 'oldest cave art'". BBC News. Archived from the original on 2012-06-15. Retrieved 15 June 2012. One motif – a faint red dot – is said to be more than 40,000 years old. ↑ South American Handbook. Trade and Travel Publications Limited. 1976. ↑ David S. Whitley (2001). Handbook of Rock Art Research. Rowman & Littlefield. pp. 712–. ISBN 978-0-7425-0256-7. ↑ Aldenderfer 1998, pp. 56–57. ↑ Inventory number 47 019.